I thought I saw a topic but can't seem too find it, why can't people demote others or premote others who arent logged on? So if they want they can log at a time when not many people are on and invite spys and demote a bunch of people if they choose (Some people are like that). Hopefully that can be fixed, sometimes people need to be kicked asap, theres no time to patiently wait for them to log at their convenience. They should be able to. Haven’t been a guard+ for a little bit but I haven’t heard of anything like this recently. 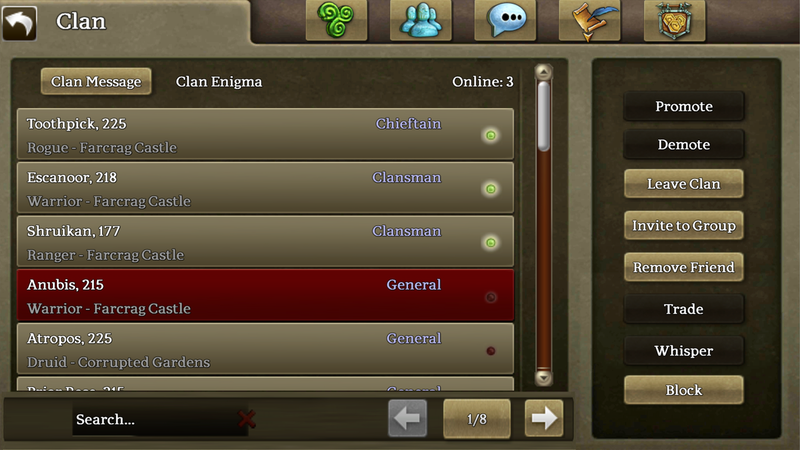 All you need to do is pull up the clan list, select their name, and hit demote or promote. If they are offline their name will appear below everyone else who are only in alphabetical order, with a red dot instead of a green to denote them being offline. bob the mage wrote: They should be able to. Haven’t been a guard+ for a little bit but I haven’t heard of anything like this recently. All you need to do is pull up the clan list, select their name, and hit demote or promote. It's been submitted to the dev team already and awaiting a fix. Sorry for the inconvenience!